Kick-A**! Striped Bass w/ Cauliflower Puree — Happy Food Co.
Striped bass is a very versatile fish due to its clean taste and firm, yet flaky texture making it a perfect ingredient for this meal! Also, this fish was rated “Best Choice” for sustainability by the Monterrey Bay Aquarium’s Seafood Watch Program. SPRAY glass baking dish with non-stick spray. PLACE four grape leaves on the bottom of the glass baking dish and lay striped bass fillets on leaves, skin-side down. SEASON sea bass fillets with lemon pepper. DRIZZLE each fillet evenly with lemon pepper olive oil and top with remaining grape leaves, completely covering fish. BAKE for 20 minutes or until the fish flakes easily with a fork. ★ Please watch for small bones and remove as needed. COOK cauliflower rice in microwave safe-bowl and cook on high for 3 minutes. MIX pho vegetable broth concentrate with ¼ cup hot water in a liquid measuring cup. ★ For a creamier non-Whole30® option, use whipping cream instead of vegetable broth and 1/4 cup grated parmesan from your pantry. 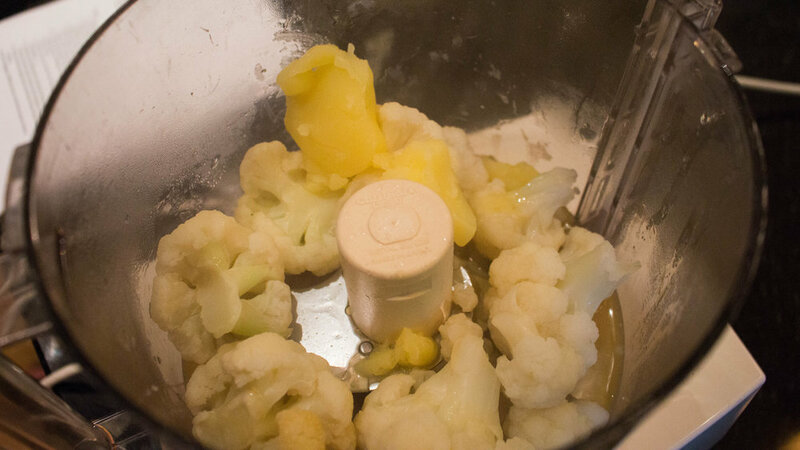 COMBINE vegetable broth, cauliflower, and HALF of the ghee in a food processor or blender. MELT the remaining ghee over medium high heat in a medium pan. ADD portobello mushrooms and sauté until soft and golden. STIR spinach into mushroom mixture until wilted but still bright green, about one minute. SEASON to taste with garlic salt and pepper. Remove from heat and set aside. 4. SERVE IT & ENJOY! REMOVE and discard grape leaves from fish. SLICE lemon into rounds on cutting board and finish each fillet with a squeeze of lemon juice. SERVE fish atop cauliflower purée with mushroom and spinach mixture. Made with grapes from Sonoma, Napa and Monterey Counties, This Chardonnay offers flavors of baked apple, pear and lemon cream, accented by an elegant finish of sweet vanilla.